Tender, 2018 Paperclay, newspaper, cork, wood veneer. 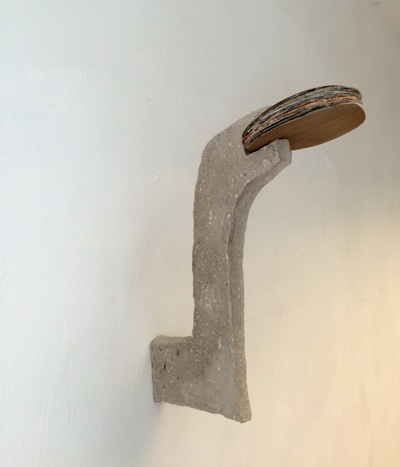 A hand bracket installed at approximate head height holds a small wad of paper, cork and wood. It offers the viewer a 'bite' of selected information sandwiched between raw materials, but slightly out of reach. The bracket, made using shredded newspapers embedded in clay, represents information assimilated through a 'digestive' making process. What the artist has assimilated in making is offered raw to the viewer. In making this piece, I am trying to understand how information and knowledge, encoded in artefacts, is offered to viewers. Can understanding be passed on or does it have to be remade each time?